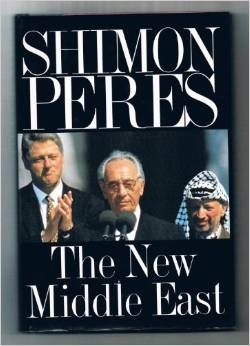 Shimon Peres offered his vision of a new Middle East in a December 1993 book. After the fall of the Soviet Union, and still more so after the signing of the Oslo accords in 1993, many confident predictions were made that we were on the brink of a "new Middle East," one in which age-old animosities were inexorably yielding to political reconciliation, the forces of reaction and disorder were being beaten back, and a new dawn of economic, social, and cultural friendship was at hand. That none of this has come to pass should by now be obvious to anyone with eyes to see. There is a new Middle East. Only, it is not the one envisioned by the post-cold-war, post-Oslo utopians. It is far more complicated than that, and far more perilous. To begin to get a flavor of this new Middle East, one could do worse than take a look at the unassuming island of Cyprus. Divided between Greek and Turkish sectors and long an area of ethnic strife, Cyprus is seething again - but in a wholly novel way. If all goes as scheduled, Russian ships will begin delivering $400-million worth of advanced surface-to-air missiles, SAM-300's, to Greek Cyprus in late November. Greek Cypriots insist they must have this powerful weapon to balance Turkish air superiority over the island. But the mainland Turkish government in Ankara, warning that the presence of these missiles will pose a danger to flights over Turkey itself, has vowed to prevent their deployment by any means necessary, including force. In turn, Athens has warned that if the Turks carry out their threat to destroy the missiles, it will come to the aid of the Greek Cypriots in accordance with the terms of their mutual-defense treaty. This is not just another escalation in the squabbles that have bedeviled Cyprus since its independence from Great Britain in 1960, and that have barely affected the region as a whole. Here is why: the Turkish foreign minister has asked Prime Minister Benjamin Netanyahu of Israel for help in preventing the missiles from reaching Greek Cyprus. Although the Israelis explicitly deny any intention of becoming involved, the Greek Cypriot government is worried enough to have urged the Russians, who plan to sell it the missiles, to exert counter-pressure on Israel to stay out. In the meantime, Greece itself, far from standing passively by, has held a military exercise near Turkey and taken steps to solidify its ties not only with Russia but with such disparate and seemingly unrelated countries as Syria, Armenia, and Iran. As for the Turks, they have been using the time before November to augment their military ties with Israel as well as with Jordan, and to move troops to the Syrian border for a possible confrontation with Damascus. In short, the ripples of this particular crisis already extend far beyond the island of Cyprus. However unlikely the prospect may seem, it is not out of the question that, should Moscow make the SAM-300 deliveries, a general war could break out in the Levant. Abdullah Öcalan: friend of the Greeks? What is going on here? Greece, a member both of NATO and of the European Union, has a democratic government and a modern economy; at this moment in history, its major challenge is meeting the criteria needed to take full part in the European monetary union. What, then, is it doing allying itself with the likes of Syria and Iran, two of the world's cruelest, most radical, and most anti-Western regimes? Why, for that matter, is Greece also backing the PKK (Kurdistan Workers party), the fanatical leftist Kurdish movement that since 1984 has engaged in one of the most aggressive terrorist campaigns anywhere, leading to an estimated 30,000 deaths in Turkey; and why, in April 1997, did over one-third of Greek parliamentarians express "solidarity with the martyred people of Kurdistan" and invite the PKK leader, Abdullah Öcalan, to visit Athens? The short answer is that the Greeks hate and fear Turks. And so, in the time-honored fashion of the Middle East, they seek to befriend other enemies of Turkey, whoever they may be and however vicious they may be. Acting on a similar logic, Turkey, also a member of NATO and a country with a democratic government, has turned to Israel and Jordan, the other states in the Middle East with a conspicuously pro-American outlook. But there is a longer answer as well. In a world no longer dominated by the rivalry of the United States and the Soviet Union, the Middle East is rapidly sorting itself into two new regional power blocs. The formation of these blocs, or teams, is a development with profound implications not only for the region but for the entire post-cold-war world, and not least for the United States. At the center of one bloc stand Turkey and Israel, two countries that in many ways are natural partners. Having maintained quiet working relations for decades, they entered into a more public and more intense period of cooperation following Israel's agreement with the PLO in September 1993. Both countries are non-Arab, democratic, and Western-oriented. Each maintains a large military and faces a major threat of terrorism. Both put great store in their relationship with the United States. And each has problems with both Syria and Iran, the two countries that happen to stand at the center of the opposing bloc. Ever since Ayatollah Khomeini came to power in Teheran in 1979, these latter two countries, Syria and Iran, have been each other's closest allies, for the simple reason that they have a host of adversaries in common. For both, the United States is an imperialist power that seeks to dominate the Middle East, despoil its natural resources, enslave its people, and repress its indigenous culture. For both, Israel, the "Zionist entity," is a stand-in for the U.S. on a more local and, if anything, more threatening level. For both, Turkey is the NATO member on their border that represents both an irritant and a constant challenge. If the core of each bloc is made up of a pair of countries, surrounding them are large, loose networks of teammates. Within the Middle East itself, Turkey and Israel count first and foremost on Jordan, which has had stable relations with Israel for decades and has also readily accepted that country's new friendship with Turkey. Jordan and Turkey themselves have enjoyed consistently good relations since the 1920's. Today, Jordanian and Turkish military pilots train in each other's country; their chiefs of staff meet regularly; and their governments have created a high-level formal grouping to discuss the menace posed to each of them by Iraq, inviting other neighbors to join a "Neighborhood Forum" on these issues. According to Turkey's ambassador to Amman, security cooperation "has reached the point where I can say that the Jordanian and Turkish military forces are integrated into one." A free-trade agreement between Turkey and Jordan is also in the offing. In addition to Jordan, potential members of the Turkish-Israeli team include Kuwait and the United Arab Emirates. (Early this year, a Turkish submarine conspicuously visited both countries.) Turkish Cyprus, it goes without saying, is totally in the Turkish camp. Also friendly are exiled opposition groups from the Middle East's rogue states-Syria, Iran, Iraq, and Libya - plus the Christians of Lebanon and Sudan. On the opposing side, Syria and Iran can count on a numerically larger group of regional teammates. In addition to Greece - which occupies a position of importance analogous to that of Jordan on the other side - Greek Cyprus, the Palestinian Authority, and the Muslims of Lebanon all weigh in on the Syria-Iran side. Relations are even improving with Iraq, which has nearly always been on bad terms with Syria and Iran alike, and the same holds true for relations with Libya and Sudan. In the constellation of the Middle East, the Kurds present a particularly interesting and paradoxical case: the movements of those living in Iraq and Iran go with Turkey-Israel; the Kurds of Turkey, led by Öcalan and the PKK, with Syria-Iran. Is it possible for a Middle Eastern country to stand outside the two-team framework? Saudi Arabia, which enjoys strong ties with the United States on the one hand and with Syria on the other, is a striking example of a state that has so far avoided choosing sides. But another case in point-Egypt-suggests that true neutrality is hard to sustain. As a major recipient of U.S. aid and the possessor of an increasingly American-style military, and as a country maintaining diplomatic relations with Israel, Egypt would in many ways seem suited to the Turkish-Israeli bloc. But on issue after issue - the Arab-Israeli peace process, nuclear proliferation, relations with Libya, human-rights abuses within Egypt itself - Cairo is on a trajectory that, in the fullness of time, might well land it on the Syrian-Iranian side. 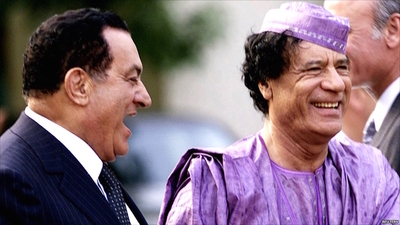 Egyptian-Libyan relations, as represented by Husni Mubarak (L) and Muammar al-Qaddafi (R), are better than they ought to be. Finally, in South Asia, Israel's long-term quest for better ties with India has been meeting with greater success now that that country is under Hindu-nationalist management; the present government has even shown an interest in joining the Turkish-Israeli bond. Pakistan, meanwhile, sides with Syria-Iran, although the tie has frayed somewhat because of the Taliban of Afghanistan, who are at once clients of Pakistan and sworn enemies of Iran. To varying degrees Pakistan has also brought along Burma and Sri Lanka, which are seeking to offset Indian power. China allies with Pakistan to check India, which objectively puts it, too, with Syria-Iran. Needless to say, all these connections are subject to the shifting tides of convenience and tactical advantage. What is impressive, nevertheless, is the extent to which the logic of "my enemy's enemy" can override even such powerful factors as shared religion or ideology. Thus, the fundamentalist Islamic Republic of Iran supports Christian Armenians and Christian Greek Cypriots against the Muslim Turks of Azerbaijan and Cyprus, while Christian Greek democrats find allies among Muslim Kurdish terrorists. Thus, too, secularist, Arab nationalist Baathists of Syria have worked with Shiite Iran against their fellow Baathists in Iraq. And thus Israeli Jews and Christian Armenians, two seemingly natural allies with parallel histories and values, find themselves agreeing on almost nothing because the former side with Turkey and the latter against it. Still, "my enemy's enemy" only takes one so far; any assessment of the relative strength and cohesion of the two emerging blocs has to look deeper for structural similarities and differences. When it comes to Syria-Iran vs. Turkey-Israel, what is immediately striking, at least on the regional level, are the differences. Syria-Iran is a rogue's pact. Hounded by their own populations, on the losing side of history, Damascus and Teheran seek solace and aid in each other's arms. At bottom, however, these two governments themselves have little in common: the mullahs in Iran question whether Hafez al-Assad is even a Muslim, and he in turn no doubt sees them as religious fanatics. Such divisions may not invalidate the connection between the two countries, but they do constrain it in significant ways. The Iranians are allowed to operate in Syria-controlled Lebanon, for instance, and they send some oil and tourists to Syria. But substantive and operational links are missing. The Turkish-Israeli tie is a completely different story. The military dimension alone goes deeper than anything on the other side, extending to the joint production of weapons and the sharing of intelligence. Israeli warplanes train in Turkish air space over the vast plains of Konya, and Turkey sends its pilots to Israel to learn advanced techniques. Joint naval maneuvers were held in January of this year, joint air maneuvers in September. Even more significant are the non-military dimensions. Thanks to the creation of a free-trade zone and such institutions as the Israel-Turkey Business Council, trade between the two countries is booming, increasing by something like 30 percent a year. Turkey is the number-one tourist destination for Israelis, and authorities in the two countries have dispensed with double taxation. Plans exist for Turkey to send fresh water to Israel via huge bags towed through the sea. A Turkish firm snagged the trophy project of building a terminal at Israel's main airport. And so forth. Then there are the political and cultural dimensions. Jerusalem has gone to bat for Turkey in Washington, and Ankara has stuck by its Israeli partner even in a den of enemies like the Organization of the Islamic Conference. There are academic exchanges, special exhibits in museums, and even mutual visits by religious leaders, something highly unusual among Jews and Muslims. The Turkish-Israeli tie, in short, has positive elements, based on interests shared not just by two governments but by two populations (though, conspicuously, not by Turkey's Islamists or leftists). A Turkish analyst, Soli Özel, judges the degree of exchange between the two countries to surpass anything Turkey enjoys with European or Middle Eastern states; the only point of comparison is with the United States. Israelis for their part are especially voluble about their friendship with Turkey and what it portends. Uri Bar Ner, Israel's ambassador to Ankara, stated upon his arrival that "we have perfect relations with Turkey," and Prime Minister Benjamin Netanyahu has proclaimed the relationship "the main axis, though not the exclusive axis, of a regional security arrangement." The depth of these ties contrasts with the superficiality of those between Syria and Iran - if the former relationship resembles that between the United States and Great Britain in World War II, the latter is more reminiscent of that between Germany and Japan. And this is unquestionably a piece of good news. Precisely because the tie extends to so many levels, moreover, from fighter pilots to businessmen to students, it bids fair to last. Indeed, the many-sided nature of the bond is critical to its long-term viability, for the human element turns a utilitarian connection into something approaching a true alliance, which in turn redounds to the strength of the security arrangements. But that hardly means that, in any serious conflict in the Middle East, the Turkish-Israeli bloc will necessarily prevail, or that its opponents are without the resources to cause havoc. When, in the wake of Turkish Prime Minister Mesut Yılmaz's visit to Israel, a Syrian newspaper condemned Turkey's "suspicious alliance" with the Jewish state, Yılmaz answered with insouciance, "Frankly, I don't care how Syria comments." But there is no mistaking the fury that has been aroused. The Lebanese foreign minister has termed the Turkish-Israeli-Jordanian connection "a pliers-like, three-way alliance to put the squeeze" on his own country and Syria. In the words of Syria's information minister, it constitutes "a grave threat to Arabs and Muslims." 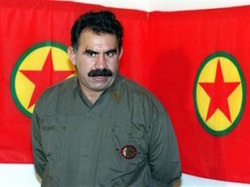 In response to that threat, the Syrian-Iranian side is attempting to organize itself in what the PKK's Öcalan envisions to be a "system of alliances of all the peoples of the Balkans, the Caucasus, and the Middle East against ... Turkish fascism." In early September, the Greek foreign minister got together in Teheran with his Armenian and Iranian counterparts; following their meeting, the Iranian media called for a regional defense alliance against Turkey and Israel. According to a report from Cairo, the Egyptian and Iranian foreign ministers plan to have agreements in place by the end of this year. The upshot is that, welcome as is the emergence of the Turkish-Israeli connection, in the larger context - the context of both teams, with their respective extensions into areas beyond the Middle East - the future is fraught with menace. The very growth of the two teams means that war, should it break out, can now spread faster and farther as local crises intermesh and stakes are raised all along the line. When conflict between Armenia and Azerbaijan erupted in 1988, it was isolated, involving no neighboring countries; that is no longer the case. Until yesterday, the Cyprus problem had almost no repercussions even in the Middle East; now it could be the match that lights the fuse on the tinderbox. That is where the United States comes in. Washington officially supports and encourages the Turkish-Israeli bond, but there is no hiding the fact that in some quarters it causes discomfort, if not downright disapproval. When pro-Western states like Turkey, Israel, and Jordan begin to work together, Western analysts inevitably begin tsk-tsking. Thus, according to a Washington Post editorial that almost sounds as if it written in Damascus, the trouble with Turkish-Israeli ties is that they may "reduce Israelis' perceived need to negotiate settlements inside that perimeter with the Palestinians and Syria." The London Economist goes further, snidely dubbing the Turkish-Israeli "affair" an "inappropriate relationship" and chastising Prime Minister Yılmaz for visiting Israel, "the Jewish occupant of Islam's third holiest city." The Turkish-Israeli connection has also led to a number of potentially problematic realignments in domestic American politics. As pro-Israel lobbying groups have begun to work successfully on Turkey's behalf in a variety of causes, Greek-Americans have pulled away from the Jewish state. When 81 Senators signed a letter in April 1998 calling on the Clinton administration to stop "using public pressure against Israel," Paul Sarbanes of Maryland, a Greek-American Democrat and hitherto a long-time supporter of Israel, conspicuously refrained from joining them. More ominously still, the emergence of the two teams has raised an echo of the cold war. The U.S. is, or is seen to be, on one side of a major regional conflict, Russia on the other. The shipping of Russian arms to Cyprus (and Iran) is only one bone of contention in a list that includes the issue of sanctions against Iraq, the American response to terrorism, Israel and the Palestinians, and so forth. That Russia is now ruled by Prime Minister Yevgeny Primakov, an unreconstructed Brezhnevite whose greatest career-long passion has been to make trouble in the Middle East, offers the prospect of still more disagreements in the future. Of course, Russia is hardly the threat to world peace it once was, and it is also the case that neither the United States nor Russia is leading its respective alliance; rather, each has been recruited onto an already-existing team. But the disarray in both Washington and Moscow these days means that the foreign policies of both countries display little logic or consistency; given the volatility of the Middle East, that in itself is a worrisome thing. Where are we left, then? The real "new Middle East" is a region in which arsenals are growing while income shrinks; Arab intransigence toward Israel is hardening; fundamentalist Islam is gaining ground; Iraq is throwing off sanctions; and new rogue regimes - the Palestinian Authority, Sudan, Afghanistan - are being added to old ones. But, in the Turkish-Israel-Jordanian bond, the real new Middle East is also a region lit by one truly promising development - promising for the area, promising for the West, and promising especially for the United States. 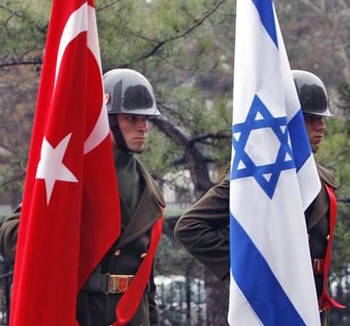 Turkish and Israeli flags; the base for America's role in the new Middle East? At long last, and through no doing of our own, we have been presented with a collection of genuinely cooperative partners in a part of the world where our like-minded friends, however stalwart, have been alarmingly few. The question still waiting to be answered is whether we have the wit, the far-sightedness, and the courage to seize the opportunity before us and, instead of hindering or standing aside, help these partners withstand their enemies and fashion a future they and we can live in. Jan. 6, 2009 update: A decade later, with Turkey having changed sides, the pattern delineated above has been ruptured. For details, see O. Winter, "Recent Attempts to Form Strategic Regional Bloc: Syria, Turkey and Iran." Apr. 27, 2009 update: The Syrian and Turkish militaries engaged in joint exercises and the Israeli defense minister, Ehud Barak called this development "disturbing," showing just how far things reversed themselves within a decade. June 23, 2010 update: Israel lost its Turkish ally but gained ... Cyprus. Feb. 11, 2015 update: Symbolic of changes wrought since 1998, Greek, Israeli, Cypriot and perhaps Egyptian forces will soon begin joint military exercises.